Picture of a reading table? A couple of days ago, I wrote a post about Bess of Hardwick’s reading. What I didn’t mention there was the description of the table on which Bess kept her books. According to the 1601 inventory of Hardwick, Bess’s books sat in her bedchamber, next to an hourglass and a mirror. Whilst it’s tempting to imagine these as the early modern version of an alarm clock and a looking-glass, for Bess they almost certainly had a more serious purpose. 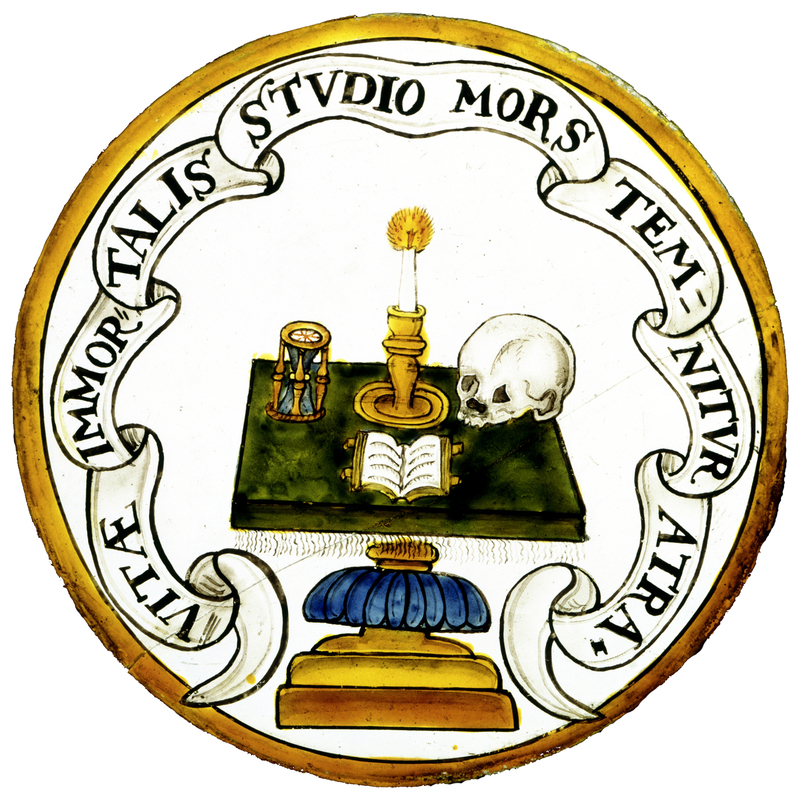 Both mirrors and hourglasses were important objects in the vanitas tradition, reminding their users of the shortness of human life. 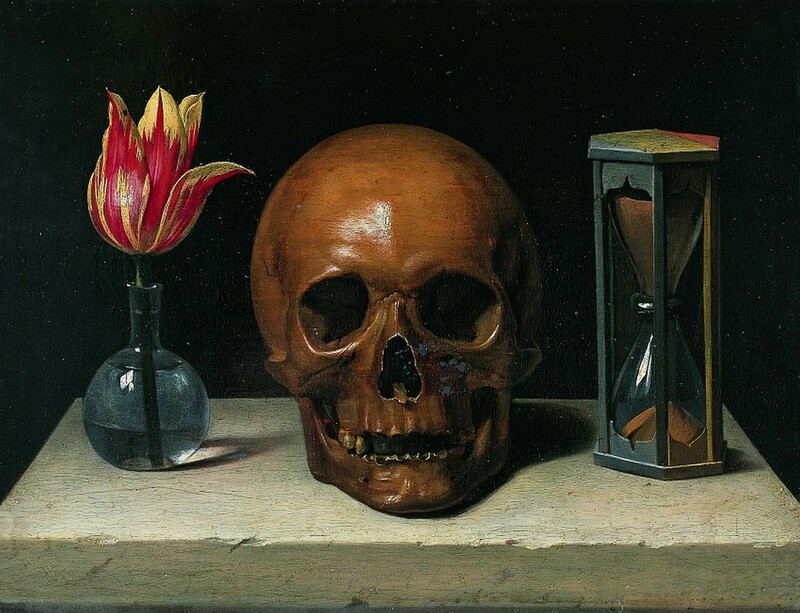 This striking painting by the French painter Philippe de Champaigne makes a vivid statement about mortality and decay. Other vanitas paintings (perhaps most famously Hans Burgkmair’s marital self-portrait) show men and women gazing into mirrors only to be confronted by grinning skulls mocking their vanity. Some early modern mirrors even had death’s heads painted on to the surface to confront users with their grisly, but inevitable, fate. The stained glass roundel shown at the top of this post was originally installed at Preston Hall near Lavenham in Suffolk (it is now held at the Victoria and Albert Museum). It gives us a very different idea of what Bess’s reading table might have looked like, and how it may have functioned! The book in this image is resting on a green tablecloth: green was the preferred colour for reading and writing surfaces in this period, understood to be especially soothing to the eyes. This picture of Bess’s contemporary, Katherine Tudor of Berain (1534-1591), by Lucas de Heere, painted in 1568, brings together the different strands I have briefly discussed here. It shows an elite woman clutching a decorated girdle book (a book which hung from a chain around her waist), and resting her hand on a skull which sits on a green-draped table. Like Katherine Tudor of Berain’s jewel-like book, Bess’s religious reading was physically located next to reminders of its owner’s mortality. The effect was, perhaps, double-edged. On the one hand, it made the moral and divine messages of the books even more urgent; on the other, it reminds us that, as phsyical objects amongst other material goods, books might possess a resonant symbolic force – looking at (rather than reading) a book might be one way to participate in the vanitas tradition and remind yourself of lurking death. This entry was posted in Art objects, Case studies, Virtue and Vice and tagged Hardwick, Hardwick Hall, Helen Smith, History of Reading, Vanitas, Women's reading. Bookmark the permalink.